Police have warned members of the public not to approach a Seal that has been spotted on the South Bank. The number of seals in the Greater Thames Estuary has increased from 685 to 938 individuals since last year, according to the Zoological Society of London (ZSL). Conservationists and volunteers took to the skies, boarded boats, and tip-toed across marshland for the second year of the annual seal survey. The Greater Thames Estuary is home to harbour seals and grey seals. Despite their close proximity to the capital, these populations are some of the least understood in the UK. But having witnessed declines of up to 90 per cent in some Scottish harbour seal populations, conservationists are now keen to keep a close eye on the smaller of the two species in the Greater Thames Estuary. "With harbour seal numbers remaining stable and grey seal numbers more than doubling since last year, the result of this year's survey is a good indicator of the health of the Greater Thames Estuary.Grey seal numbers are increasing along the East coast, so it's not surprising that more are moving into the estuary. However, it is important that we use the same methodology to complete the survey every year in order to identify these changes, and investigate how this affects the harbour seal population." A survey has found hundreds of seals are living in the Thames. It is the first survey of its kind that has been conducted. It is thought the seals' presence is a bonus to London's marine life. There are around 500 harbour seals and 200 of the larger grey seals in the Thames Estuary, according to the Zoological Society of London (ZSL) said. 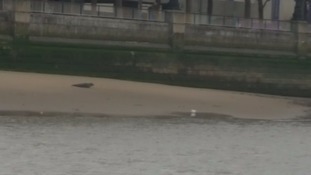 We knew there were a lot of seals in the Thames but 708 is pretty incredible. In previous results there's been a good few hundred in the Thames, but it's great to have a figure we can use as a baseline. Now we know the numbers and where they are, it can help with conservation. It's a really good indicator because the seals are the top predators in the marine food chain, and it shows that the marine environment is relatively good and is producing enough food for the seals to eat. More than 700 seals have been recorded in the Thames Estuary. In the first ever count by air, land and sea, the Zoological Society of London found hundreds of grey and harbour seals along the Thames and in small creeks and rivers.